Pireaus, Greece Travel, Greek Islands. Pireaus is located in the West of Attica about 5 Km from the center of Athens, the port of Athens since Classical times, is today a metropolis in its own right, containing much of Greater Athens industries, as well as various commercial activities associated with a port. For most visitors it is Pireaus inter-island ferries that provide the reason for coming. The easiest way there is by metro – it's the last stop. Perhaps the most fulfilling pursuit is to check out some of the port's excellent eating options – you'll find several budget restaurants around the market area, back from the waterside Pasalimani, Akti Miaouli, Tourkolimano, Kastela. For more substantial meals, there is a string of ouzeri and seafood tavernas along Akti Themistokleous, west of the Marina Zea, most of them well-priced. If you're staying in Athens prior to heading out to the islands, it is worth calling the phone number 143 to pick up a schedule of departures for the current day. Most of the boats leave between 8am and 9am for the main Cycladic islands, around 1pm for the major Dodecanese islands, between 5pm and 6pm for the northeast Aegean islands, and around 7pm for Crete. The best plan is to get to Pireaus early and check with the various shipping agents around the metro station and in the Platia Karaiskaki. We are sure that most of you have heard, at least once, the song Ta Paidia tou Pirea, which was composed by Manos Hadjidakis and was sung by Melina Merkouri in the film "Never on Sunday". But not many people know much about the place that was made world-famous by that film and song: the city and port of Piraeus. Due to the rapid development of the area between them, Athens and Piraeus have really become one big city, the boundaries between them being more of an administrative nature rather than real ones. The city of Piraeus, planned by the architect Ippodamos from Melos, was built in the middle of the 5th century B.C. Ippodamos' plans were used as guidelines for replanning the city in 1834. Porto Leone: Piraeus was known in medieval times as Porto Leone, a name due to the enormous stone lion which guarded the port's entrance. 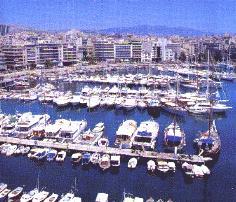 Piraeus is the main port of Athens, the biggest in Greece and one of the most important in the Mediterranean Sea. Today, the life of Piraeus is centered around its three ports: the main, central one and those of Zea and Mikrolimano. Piraeus is the most important shipping, industrial and transport centre of the country. You can walk around the central harbour, shared by cargo and passenger ships alike, and watch the constant comings and goings of goods and people from around the world. Then, continue your walk to Kastella, a hill full of beautiful houses, with a great view of the Saronic Gulf and visit the city's archaeological Museum. In Mikrolimano you can treat yourselves to an ouzo accompanied by seafood mezedes, in one of its many tavernas and restaurants. People from all over Attica come here for a meal of fresh fish. In the afternoon, a stroll around the yachts and sailing boats moored in the marina Zeas, can prove to be very beneficial to the weary traveller. If the night finds you in the area, you can try one of the many bars found nearby. The pace of life in Piraeus is set by the sea, which seems to encompass the whole city. Actually it once did, as Piraeus was an island in ancient times. Travellers were then ferried from the mainland to the island (the verb in Greek being: die-perae-ounto) and this is probably how its name came to be Piraeus. The History of Pireaus: Themistokles was the first to realise the importance of Piraeus to the city of Athens and turn it into the city's main port, instead of the Gulf of Faliro, which was used by the Athenians until the 5th century B.C. Wanting Athens to have a fortified port he built the wall of Piraeus, the construction of which took from 493 to 479 B.C. Later Perikles completed the fortification by building the Makra Teiche (the Long Walls), which protected both sides of the road all the way from Piraeus to Athens. The Main Harbour: Its ancient name was Kantharos and nowadays it is the centre of the city's life. This is where you will get a ferry to all of the Aegean islands (with the exception of the ones belonging to the Sporades) and Crete. Zea: Zea's marina is the place where some of the most impressive yachts and cruisers in Greece are moored. The coastline is full of restaurants, tavernas, bars and shops catering for the needs of yachtsmen. Mikrolimano: This port, once protected by the goddess Mounichia Artemis is today a popular hang-out for tourists. It is a lovely little harbour full of fishing boats, small vessels and some very beautiful yachts. If you like fish and seafood, try one of its famous tavernas. Kastella: Built on a hill which is also known as Prophetis Elias, Kastella is Piraeus' most fashionable neighbourhood. If you walk towards the top of the hill you will find yourselves in narrow streets surrounded by picturesque houses. The view of the central harbour, Zea and Mikrolimano, from here Is unique. The Municipal Theatre: It dominates one of the city's central squares. It was built in the 1880s. Korai Square in front of it, is one of the spots most frequented by the residents of Piraeus and is their favourite meeting place. The Monastiraki of Pireaus: A flea market like the Athenian one of Monastiraki. One can find real bargains here. It takes place every Sunday on Dragatsaniou and Mavromichali Streets. The Archeological Museum: The Piraeus Museum contains objects, mainly sculptures, discovered in Piraeus and the area of the Attic coast. The exhibits are representative of the history, the acme and decline of the ancient city. Pay particular attention to the five bronze statues discovered in Piraeus in 1959: The Archaic Kouros-Apollo, two statues of Artemis, the Piraeus Athena and a tragic mask (4th century B.C.). The Maritime Museum: You will find it on Akti Moutsopoulou and its exhibits cover 3,000 years or so of Greek naval history. Flying Dolphins: Departing from the harbor of Pireaus to: Poros, Hydra, Spetses and ports in the Peloponnese, in Arcadia (Leonidio and Tyros), in Argolida (Ermioni, Porto Heli, Tolo and Nafplio) and in Lakonia (Kyparisi, Monemvasia and Neapolis). Departing from the central harbour to: Aegina. Getting There: From Syntagma Square take the No 40 green bus. From Omonia Square take the No 049 bus or the metro which will take you to Akti Kondyli in about 20 minutes.